There’s a festive reindeer in the window of Savile Row tailors Huntsman. There is some dispute among the staff as to whether it is, in fact, a reindeer, or a mere stag. But it is definitely dressed in a spotty red silk scarf. And its name is Brian. Chatting to some of the cutters and tailors there last week, it was interesting to hear that the back part of the ground floor was only opened up four years ago. As this back section houses all the cutting, with five full-time cutters on board now, it seems natural to have it on view. A feeling of involvement with your clothes is a key benefit of bespoke, and without this open plan the connection would be lost. It’s also a wonderfully bright room, the ceiling being almost entirely skylight. But that does make it noisy when it rains. Talking of the cutters, it was noteworthy that one is now dedicated to women’s tailoring. Having a woman in this role makes a vast difference, as I have seen with my own eyes when men’s tailors take the measurements, and discuss style preferences, of women. No matter how discreet the tailors are, it is not easy for many a woman to discuss her shape. And even harder to communicate how she’d like something to be cut. 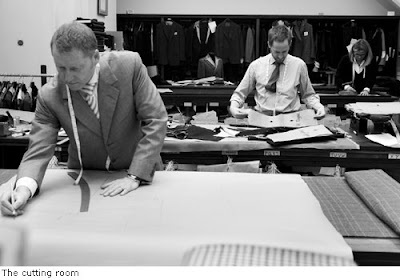 Far easier if the cutter is a woman trained in womenswear and coming fresh to Savile Row tailoring, rather than the other way around. It was good to chat to some of the other staff as well, who demonstrate an impressive range in ages. The first-floor room is more youthful than any other I have visited in Savile Row, with three young tailors. Looks can be deceiving though – coatmaker David Hayes started as an apprentice at Huntsman 12 years ago and has now trained the other two. One of them showed off a gorgeous tweed shawl-collar jacket of his own design (after some jeering from his colleagues). 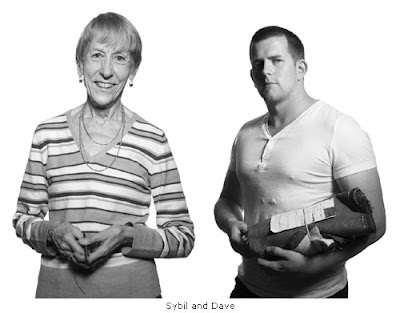 Down in the basement, a rather older generation is led by finisher Sybil Dance, who has served Huntsman for 57 years. She claims to have started when she was two. Sybil also loves the reindeer, but maintains it should be called Rudolph. The pattern room is fascinating to browse – full of both client patterns and works in progress. I was struck by one coat in particular, a wool coat in a large herringbone pattern, alternating grey and bright blue. Lovely. 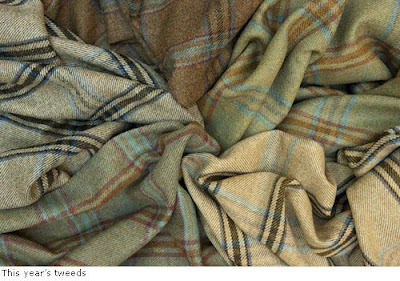 Being Huntsman, tweeds stand out as well. After a relatively muted range last year, this year’s offerings are far brighter and – in that way – more typical of Huntsman. The Bridgend and Ellen are deceptive, a conservative ground allowing pink, mauve, orange and turquoise to play in the checks. And the Finlaggen and Charlotte, with their stronger vertical lines, have been much photographed in recent magazine shoots. All are exclusive to Huntsman, the collection rounded off with the Bowmore. You can follow the discussion on A pleasant visit to Huntsman by entering your email address in the box below. You will then receive an email every time a new comment is added. These will also contain a link to a page where you can stop the alerts, and remove all of your related data from the site.